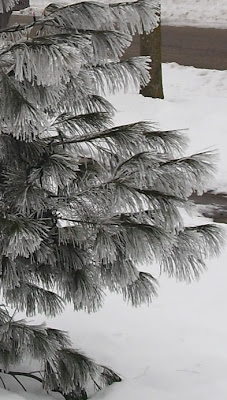 Winter is doing its damnedest to seduce me with its austere beauty. 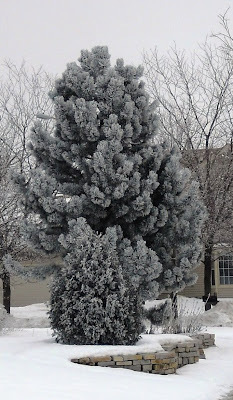 It hasn't snowed in a few days, but a recent freezing fog has left a lovely, frosty coating on the trees. Frost on the needles of a small pine tree in my garden. It won't work, I tell you. Winter is still a cruel, cruel season. ...but from the rear, it is clear that she is suffering from planting pattern baldness. Well, it looks like there are the beginnings of a comb-over, though. Maybe it's not so bad.